This entry was posted on Monday, May 21st, 2012 at 10:43 and is filed under Destacados, Restaurants & Josper, Webs y Blogs. 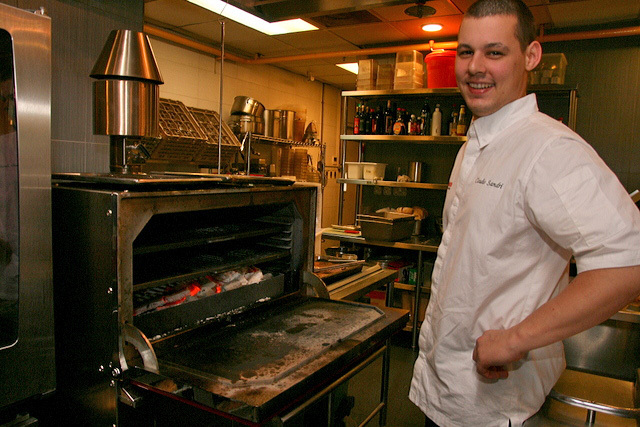 Meet Brasserie Wolf’s Chef de Cuisine Claudio Sandri. He’s young, talented and exuberant. And his new Josper Grill is set to thrill. This reputed Josper Grill from Spain uses slow-burning ‘white’ charcoal for more precise cooking and better retention of flavours. 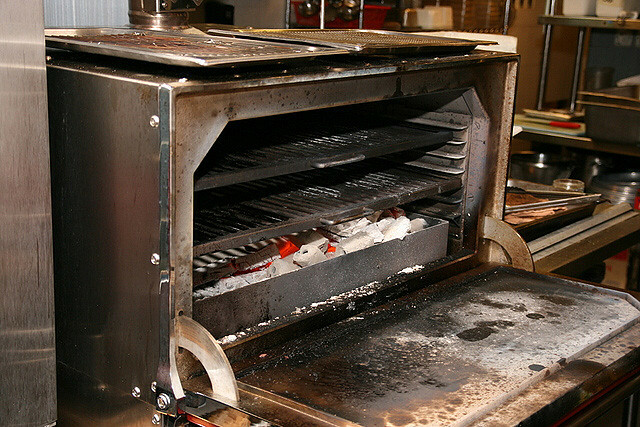 The intense hot charcoal and enclosed space also lend an enticing smoky aroma to ingredients grilled within. Chef Claudio who has worked at iconic places like Wallace Restaurant London and Brasserie Joel, brings a cheerfully creative touch to modern casual French fare. He’s introducing new chef specialties using the grill and is quite excited about it. And you know what? Before he even came out, I could taste a strange kind of happy vibe in the food. 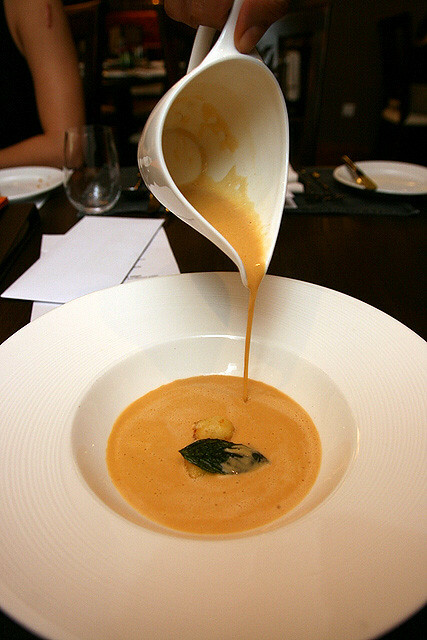 We started off with an insanely delicious soup. Note that all these are tasting portions (actual sizes two to three times bigger). Charcoal Grilled Tomato Soup with buffalo mozzarella crisps and basil oil (S$17). This is one tomato soup that isn’t boring for sure. The intense flavour and aroma of grilled tomato is blended with what must be an incredible stock and a touch of cream. Amazing. Portobello Mushroom Salad, St Maure Goat Cheese, Sunflower seeds (S$18). 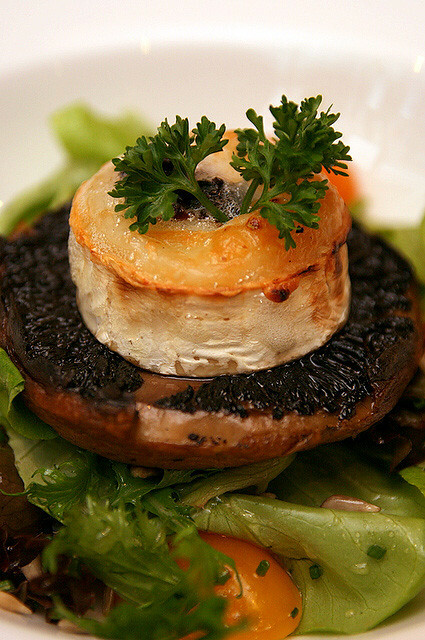 The goat cheese and grilled mushroom pack a nice punch, and the rest of the salad makes it sweetly refreshing. 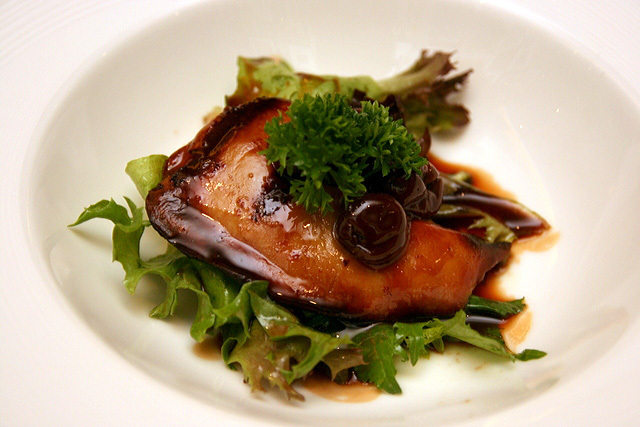 Josper Grill Rougie Foie Gras with Griottine Cherry Sauce (S$26). The foie gras is just gently burnished and still very tender. I found the sauce a little too sweet and overpowering though. 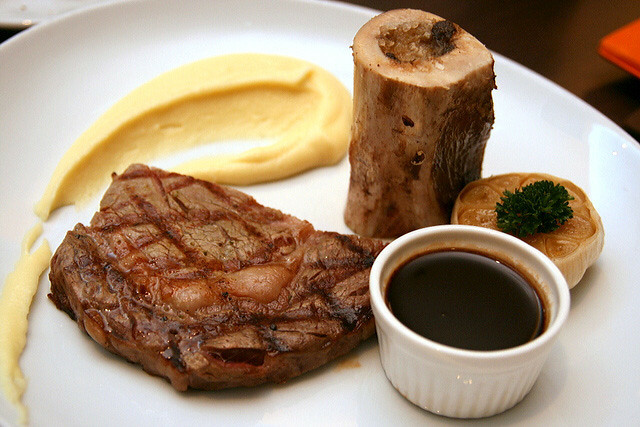 USDA Choice Ribeye (220g), bone marrow, bordelaise sauce and mashed potato (S$40). This serving shown here is only 100g. We all enjoyed this. Scoop up some of the grilled garlic, mix it with the bone marrow and spread it on the steak. Delicious. 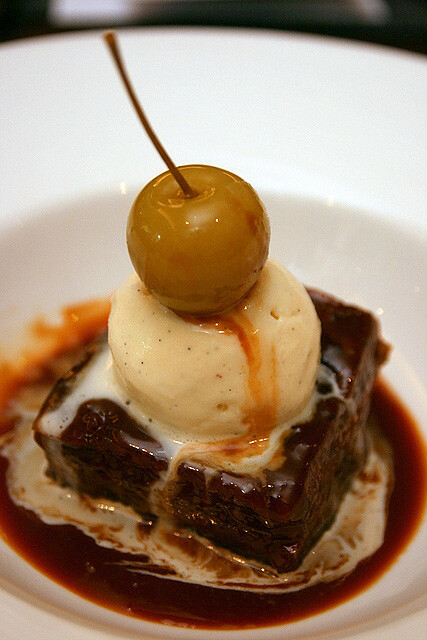 Steamed Toffee and Date Pudding with toffee sauce and vanilla ice cream (S$14). Very nicely done – soft, dense, yet not mushy – and loaded with slabs of date. The cherry apple on top is interesting too – it tastes like what I’d imagine a “Granny Smith” grape would be! 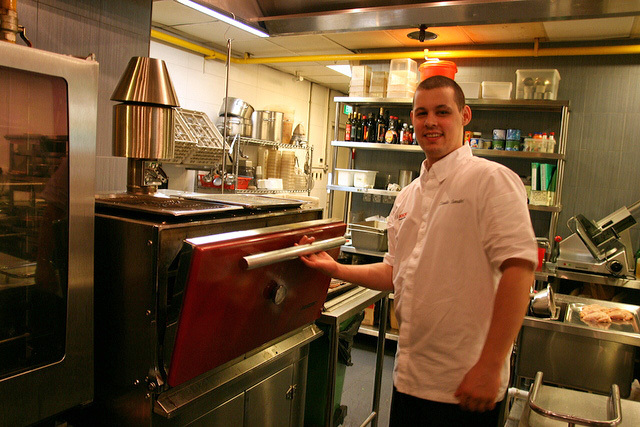 Chef Claudio Sandri showing us the Josper Grill in the kitchen. We did feel the heat! So this baby can do whole fishes, prime meats, foie gras, vegetables, and so on. I have to say, the results are pretty good. Chef Claudio also has new seasonal dishes available such as Mussels a la Mouclade D’aunis ($29) – mussels with a touch of curry, Octopus Salad with baby spinach, grapefruit and honey-mustard dressing ($18), and Piment D’Espelette Spiced Lamb Rump with Provençale tomatoes, crushed potatoes and olive sauce ($35); all of which reflect his penchant for simple cooking and quality produce. Classic favourites like the Traditional French Onion Soup ($17), Argentinean Beef Steak Tartare ($27), and Crispy Duck Leg Confit ($34) are still on the menu. Brasserie Wolf also launched a weekend set brunch (S$39++ per person) on Saturdays and Sundays from noon to 5pm. Tuck into eggs any style, with freshly grilled bacon, sausages, tomatoes and mushrooms. Croissants and breads will be served along with homemade jam and butter. The brunch also includes a hot drink (coffee, tea, hot chocolate) and cocktail. Weekday lunch sets go for S$21.90 (two course) and S$31.90 (three course) sets. There’s even an Early Bird Dinner set (S$35++ per person) on weekdays from 6pm to 7.30pm with items like Duck Rillette and Spaghetti Fruit de Mer with scallops and prawns. Fri, Sat & Eve of Public Holidays 6 – 11 p.m.